When we moved, I thought that I may not be able to find certain ingredients, such as black sesame seeds (as it’s more commonly used in Asian cuisines), so I was quite surprised to find not just white, but also black sesame seeds in the local markets! Black sesame desserts are one of my favourites because of its uniquely rich, nutty and slight smoky flavour. I’m hoping to grab some glutinous rice flour so I can make some black sesame dumplings soon, but first, let me make some cookies! I first made these cookies 2 years ago and I was in love with them ever since! I love these cookies because they are not too sweet and have a lovely crisp and crunch as the butter is creamed with caster sugar instead of icing sugar. On a random impulse this time round, I decide to incorporate both white and black sesame seeds into the cookie batter separately and make chequered cookies. Making chequered cookies is definitely not difficult, it’s just a little more time consuming as you need to roll out the dough, chill, cut, assemble and chill again before they can be baked. 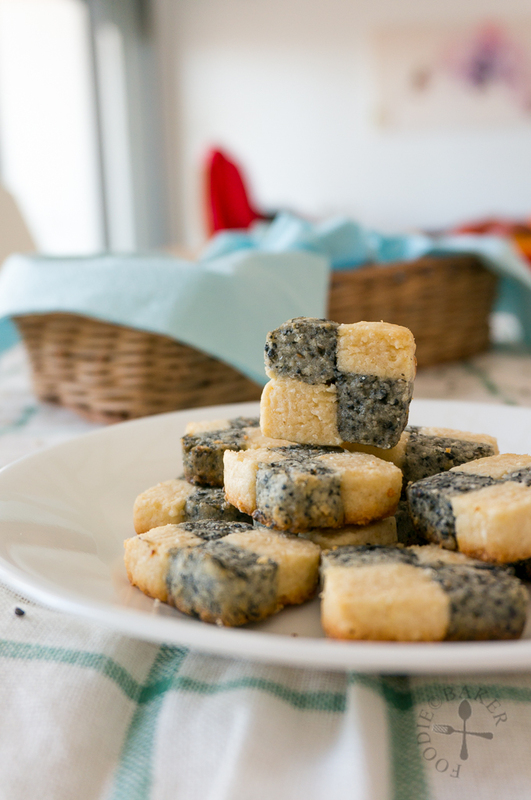 But I really love the visual effect of these cookies, even though they didn’t turn out to be perfect squares. The mini ones are adorable but the big ones are more satisfying, which one would you have preferred? If you haven’t tried these cookies before, it’s definitely time to make some! The total time excludes the chilling time, so factor in another 1.5 to 2 hours if you want to serve these cookies on the same day. Preheat oven to 180 degrees Celsius. Toast the black and white sesame seeds on separate trays until the white sesame seeds is lightly golden, about 5 to 7 minutes. Remove from the oven and let cool completely. In a food processor, grind the white sesame seeds with 1 teaspoon of honey until fine. Repeat with the black sesame seeds. Set the sesame pastes aside. Weigh your empty mixing bowl and note it down. Place the butter and sugar in the mixing bowl. Using an electric mixer, cream the mixture on high speed until light and fluffy, about 5 minutes. Add in the egg yolk and beat on medium speed until incorporated, about 1 minute. Now weigh your mixing bowl again, subtract the weight of your empty mixing bowl and scoop out half of the dough into another mixing bowl. Mix in ½ of the flour (77 grams) and the black sesame paste into one portion of the dough and the remaining flour and white sesame paste into the other portion. If the dough is too stiff, mix in drops of milk until soft enough to handle. Wipe the table top with a damp cloth and line a plastic wrap on top (so that the plastic wrap will stay in place). 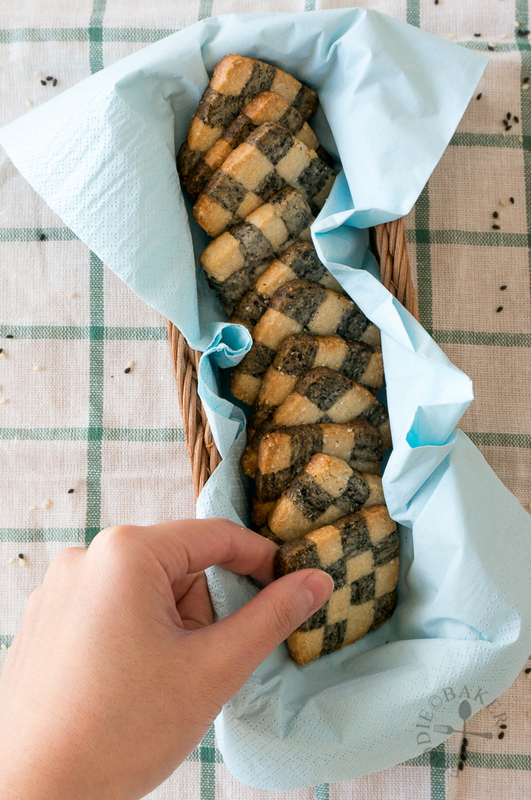 Place the black sesame dough on top of the plastic wrap and shape it into a 4 x 7.5-inch block. Wrap the dough with the plastic wrap and chill in the refrigerator for 30 minutes to 1 hour. Repeat for the white sesame dough. At this point, you can also freeze the dough until you need it. There is no need to thaw the dough, just add 1 to 2 minutes to the baking time. Slice the chequered dough into ¼-inch thick slices and place them on the baking sheet. Bake for 10 to 12 minutes for large chequered cookies and 8 to 10 minutes for small chequered cookies, until the edges are lightly golden. Let the cookies cool completely on a wire rack before storing it in an airtight container. - Use a small food processor as the amount of sesame seeds is very little. If you don't have a food processor, pound the sesame seeds in a pestle and mortar then mix in the honey. 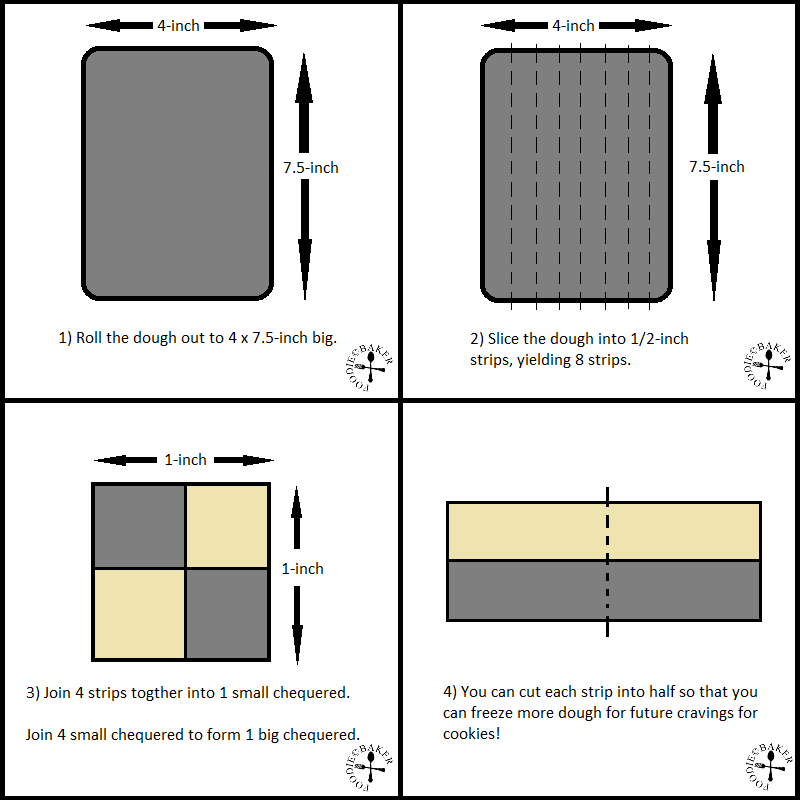 Hope the above pictorial will be useful if you are making chequered cookies! If you need step-by-step photos, head over here to see them! Hi Nami, thank you so much for the feature! 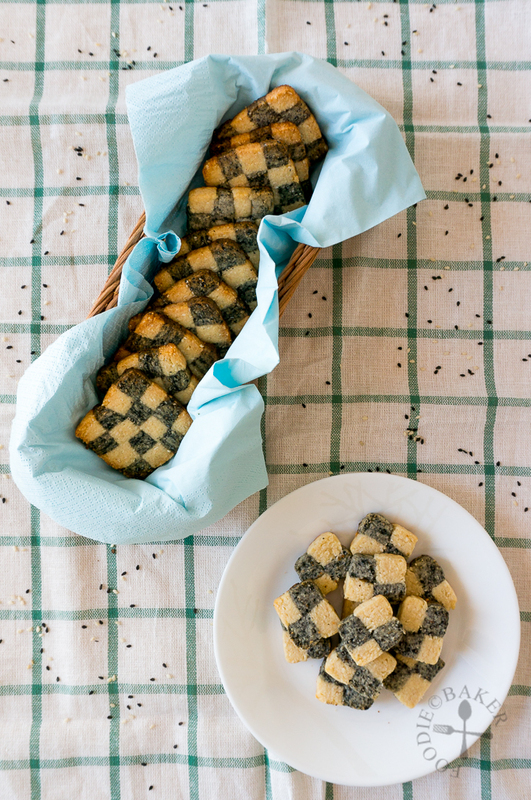 I love your sesame cookies recipe and am really happy to try out a checkerboard design with them! Lovely cookies! so glad to hear that you are able to find sesame seeds over there! Either the big or the small cookies, I’ll be happy to munch either one! Hi Joyce, yes I’m glad I was able to find them! I couldn’t decide which size to eat, so I always end up eating both… oops! Looks perfect! 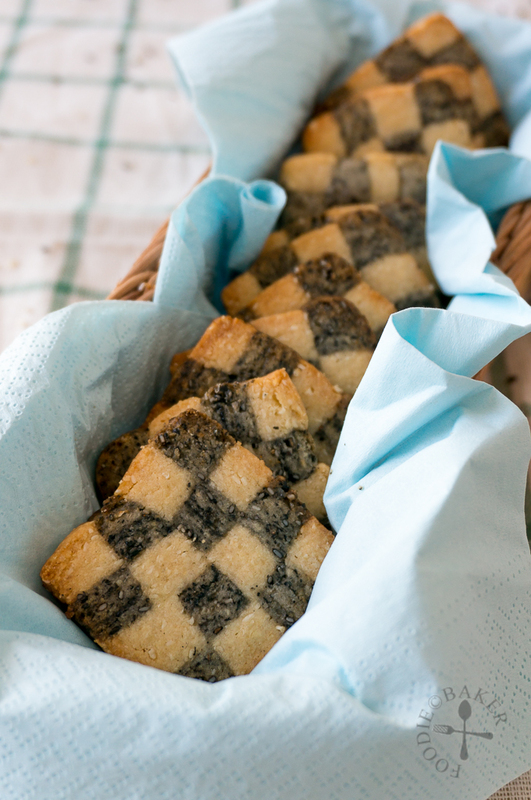 I have yet to bake a neat set of checkerboard cookies! Thank you Jean, mine is not that neat, I’m sure you can do better than me! Thank you so much Monica, wish I could send you some! Thanks Charmaine! If only I can send some big sesame cookies to you! Wow this looks cool! and thanks for the detailed instructions on how to make them. Thanks Raymund! Hope you have the chance to make them one day!